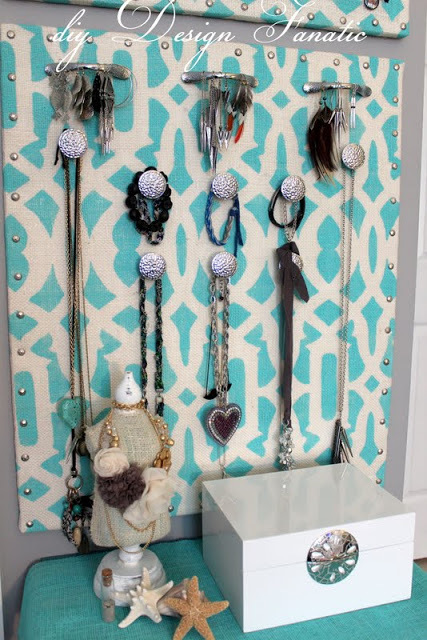 The jewelry organizer was made out of a piece of plywood cut to the same size as the existing cork board. Pam cut two pieces of burlap to be a few inches larger than the boards. The burlap was then secured to a stable surface with painters tape. After Pam painted the plywood and cork boards with white paint, she began stenciling the burlap using a dense foam roller, Valspar Nautical paint, and Cutting Edge Stencils‘ Trellis Allover Stencil! The interlocking design of the Trellis Allover Stencil made it easy for Pam to paint the entire piece of burlap without missing a beat! After the painted stencil design dried, Pam attached the burlap to the plywood and cork board with a staple gun from behind. 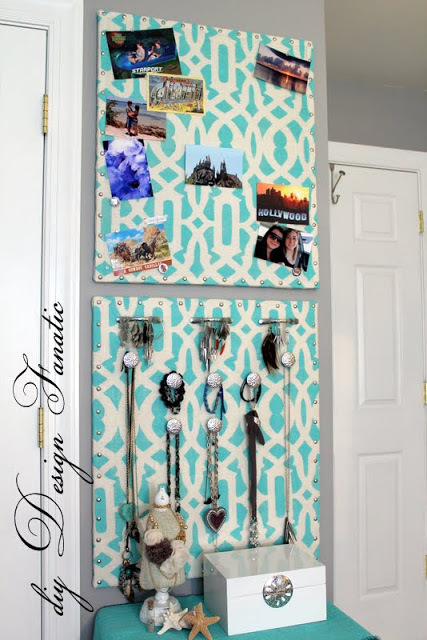 For a totally chic look, Pam attached upholstery tacks to the edges of both boards. She then screwed on drawer pulls (to hang earrings) and knobs (to hang bracelets and necklaces) from the back of the plywood for the jewelry organizer. Want to create your own craft project using stencils? Shop Cutting Edge Stencils for the Trellis Allover Stencil and more! Read our blog posts about other how-to stencil projects! Post pictures of your finished projects on our Facebook page!